A merger between Oregon's largest business associations exposes divisions in the state's increasingly fragmented for-profit sector. For 17 years, the business community has spoken with two statewide institutional voices: that of the venerable Associated Oregon Industries, a powerhouse since the 19th century, and of the Oregon Business Association, a rebel offshoot that challenged AOI in 1999 from a left-leaning flank. Now those voices will become one under the name Oregon Business & Industry. The new if not exactly inspired moniker, a reference to the organization’s dual parentage, signals a new unity of purpose for the estimated 1,600 businesses it will represent — one that aims for a bipartisanship that may be impossible to achieve in a polarized political world. Leaders in the new organization say they hope to resolve their discordant views to come up with a unified voice in battles over taxation, education funding, regulations, and other issues they deem important. “There are divisions out there, but it’s clear to us that difficult conversations are best had amongst the business community rather than by multiple voices inside the halls of the capitol,” says Pat Reiten, a senior vice president for Berkshire Hathaway Energy, PacifiCorp’s corporate owner, and AOI’s immediate past board chairman. But cracks in the model are easy to find. The urban-rural divide over economic opportunity, conflict within the business sector over environmental regulations and the challenges of engaging tech-savvy entrepreneurs in the time-sucking world of public policy debate all pose growing challenges to the new organization’s leaders. Tom Kelly, owner of Neil Kelly Co., and a founder of the Oregon Business Association, this month will launch the Oregon Business Alliance for Climate, which advocates a “climate policy” and calls for a carbon emissions tax, a policy AOI has opposed. The group’s founders are mostly young entrepreneurs leading companies that create software or build smartphone apps. 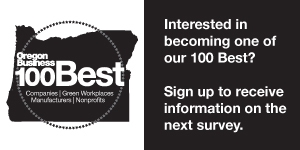 Few of its members have joined the more established statewide or Portland-area business associations such as the Portland Business Alliance. The Business for a Better Portland agenda gives top priority to issues that would be afterthoughts for many business groups: housing stability and affordability; workforce inclusion; shared prosperity; safe transportation options; and collaboration with elected officials. RELATED STORY: IS OREGON GOOD FOR BUSINESS? It’s not uncommon for industries or special interests to form trade or advocacy groups, and neither of the new organizations directly challenges OBI’s vision of a unified business voice, as the Oregon Business Association did in 1989. It was then that Tom Kelly and Nik Blosser (now chief of staff for Gov. Kate Brown), chafing at both what they saw as ineffective leadership and the Republican-influenced agenda of AOI on environmental and other issues, broke ranks to form the OBA. Mark Stevenson, now vice-president of Pacific Continental Bank, joined OBA when he was CEO of the former Capital Pacific Bank. He embraced its politically moderate values, noting that it gave awards of honor to Democrats and Republicans alike. The emergence of new statewide voices signals OBI’s challenge in balancing liberal and conservative values in the state’s business community. The new OBI also has to deal with some latent skepticism about the merger, particularly from those who regret that the two organizations ended up so much alike in their policy positions after the political passions driving the split had cooled. Unwilling to get on the wrong side of the new order, some won’t comment publicly on past disagreements. Justin Delaney, a vice-president of The Standard in Portland who has been active in both AOI and OBA, says the new organization’s challenge is clear. The new economy is larger and more diverse geographically and in business types, and the political winds change over time. The organization must deal with issues on their merits without aligning to a party’s agenda. In the eye of the storm is Sam Tannahill, OBA chair. He and his wife are part owners of A to Z Wineworks, one of Oregon’s largest brands with production of 400,000 cases a year, and Rex Hill vineyards and winery in Newberg. Tannahill said he made a commitment to public involvement as his business prospered, serving on the Oregon Wine Board and as president of the Oregon Winegrowers Association before searching out broader avenues for civic involvement. Tannahill sees his advantage as being as a man engaged in numerous worlds — agriculture but not traditional farming, working in a rural area but living in Portland, a traveler who does business with growers and suppliers around the state. His leadership skills will be tested when OBI launches on July 1. The timing for the merger’s effective date is awkward: Battles over taxation and other issues have consumed the time and energy of both business groups, leaving no time to finish the task of hiring a new CEO. Jay Clemens, who is retiring as AOI president and CEO, will remain as OBI’s interim leader until a new executive is hired this summer or fall. Ryan Deckert, president of OBA, with the merger and hasn’t announced his career plans. The boards of the two business groups will become one. AOI chairman Scott Parrish, CEO of A-dec Inc. in Newberg, becomes vice-chairman and replaces Tannahill as chairman after one year. OBI board members will be elected by the full membership, following AOI’s model rather than the self-perpetuating board model of OBA. While the organizations call their alliance a merger, in the legal sense it’s a takeover by AOI of the much smaller OBA, which has about 300 members. AOI operates an insurance program for its members, and it was simpler to fold OBA into that more complex corporate entity. That detail is one reason why skeptics grumble that the new alliance is really an acquisition of OBA by the much larger AOI, not a merger. Other business leaders say the new OBI’s policy agenda is a blend of the policies of the two departing organizations. “There were very few places where you could put a piece of paper between the two organizations in terms of issues,” says Pat McCormick, an AOI board member who is actively involved in merger details. The new leadership will come off a bruising legislative session in which businesses offered only qualified support for new business taxes, with the Oregon Business Plan coalition calling on the state first to cut employee costs before adding a new corporate tax. The coalition’s message, trumpeted on its Brighter Oregon website, is standard rhetoric for business organizations and will likely be adopted by OBI. The message is rooted in the influential Oregon Business Plan, the North Star in business agenda-setting in the state’s political culture. The plan, guided by an advisory committee representing the state’s most influential corporations, calls for tighter controls on government spending as a prerequisite to new taxes. “The OBA philosophy was bipartisan and non-partisan,” vice president of Pacific Continental Bank Mark Stevenson says. "What's good for Oregon was good for business.” Whether fairly or unfairly, Stevenson says, he viewed the values of AOI as too conservative: “What’s good for business is good for business." Given the overwhelming obstacles to making a serious dent in state pension benefits, it’s a muddled message that signals to critics that business organizations are quick to oppose taxes but slow to support public policy solutions to education funding and other urgent needs. Business for a Better Portland is taking public swipes at the business coalition’s cut-before-tax stance in recent statements, including an opinion piece by three of the group’s leader that was published recently in the Portland Business Journal. “Cutting the budget alone won’t put more teachers in our classrooms or provide health insurance for those who need it most," said marketing executive Kerry McClenahan, restaurateur Bryan Steelman, and software executive Mat Ellis. “We can’t wait to solve these problems next year or next decade,” they wrote. Tannahill, 48, will need plenty of help to unify Oregon’s business voice. It helps that he has friends from across the political spectrum and that he represents an industry with a positive public image. Jon Chandler, CEO of the Oregon Home Builders Association, sees his selection as OBI’s first leader as an example of how Oregon’s business advocacy groups adapt to change. But Oregon, like the nation, is changing in ways that challenge the seemingly magical consensus of the Gov. Tom McCall era that resonates with Tannahill. Donald Trump won 28 of Oregon’s 36 counties, but you wouldn’t know it as a resident of Multnomah County, where Trump won just 17% of the vote. And while Business for Better Portland advocates collaboration with elected officials, Malheur County is known nationally as a hot spot in a national anti-government movement, albeit one driven largely by outsiders. Perhaps the business association split 17 years ago is repeating itself in a new form. Oregon’s economic expansion brings new voices to the chorus, with fresh ideas about how to solve political and social problems that have vexed generations of leaders. The next split could be between the old and some new ways for achieving prosperity and social change. Tannahill is both optimistic and fearful about Oregon’s future in a time when consensus may be as fleeting as this summer’s solar eclipse. This article was an interesting beginning to the discussion about the urban and rural divide. While the article rightfully focused on the merger of AOI and OBA and discussed taxes, I did not see a discussion of how this newly merged group will address the continuing lack of skilled labor and the awesome divide between urban and rural workforce development. Perhaps we can have a continuing series of articles on the merger with coverage about tax reform and workforce development.